The Genealogue: Witch is Where? 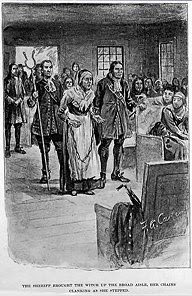 Rebecca Nurse is a direct ancestor of mine. I visited the homestead in July 2004 and had a great time wandering around, talking to the docents, etc. Another long-lost cousin! Maybe we'll run into each other at a Towne family reunion someday. Have you been to a Towne reunion? I haven't. I'm a San Diego guy, so it's a long ride. Nope. After 10 or 11 generations, my family somehow lost touch. I to am a long lost cousin! I'm a direct descendant of Edmund Towne - Mary and Rebecca's brothr. The name was able to be kept in line until my grandmother on my matrnal side. Now we just keep it with middle names, like mine. I'm sure there are a ton of us out there though. Do you guys have the 1914 book that is the family tree? If not, there's a book printer in Salem that still prints it. I don't know how I missed this one earlier. I'm descended from Mary Estey as well, so hi there cousins Randy and Brian! Did they find anything on the property? Here's a later article, and some pics.